This past weekend we went camping again. We had planned on going for about two weeks but the weather looked daunting. It was pouring in the Twin Cities and was supposed to rain throughout the night and a chance of snow Saturday morning. Not the best forecast for camping - but we have cold weather gear. After much deliberating we decided to flip a coin, eventually the coin told us to go camping. So we finished packing and loaded up the car. We were headed to St Croix State Park which is less than two hours away and was far enough south that it should have missed the previous weeks snow storm. We took our time getting there through rush hour and deluges. We arrived around 8pm - checked in and headed to the campsite. Our original plan was to car camp on Friday and then backpack to some sites for Saturday night. The park only had one of three campgrounds open and had actually just turned the water on at the shower house! We got to our site and hurriedly put up the tent - this is our new 4 season backpacking tent so it is pretty easy to put up and the inside didn't get very wet due to the limited amount of screen and the attached rain fly. I'd say in 5 minutes we were ready to go. We got back in the car to warm up a bit before making the final surge and calling it a night inside the tent! It was a cold night in the lower 30's but we did ok in our mummy bags. We awoke Saturday morning fearing the worst - but found clear skies and warming temperatures. An early morning drive to get warm turned into an all day adventure. We had left the gear in the car so we were able to have a picnic breakfast next to the St Croix River. 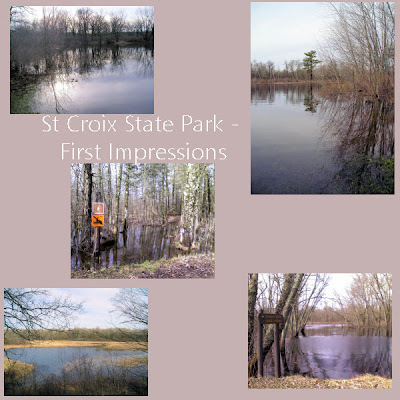 You can see from the pictures that there was a lot of standing water and rivers and streams were overflowing. We had some camera malfunctions so some of these pictures are taken with my cell phone! It has been a busy week so I haven't had a chance to do much else with pictures. I will try to get more ready and update you later on the rest of the weekend!